Weak abdominal muscles, jobs that require a lot of standing, pregnanacy, and obesity (large protruding abdomen) sometimes countribute to sway back posture. The pelvic tilt exercise will help strengthen your abdominal muscles as well as help reduce the curve in your lower back if you have sway back. The pelvic tilt is done by tightending the abdominal muscles and the buttocks muscles at the same time. This pulls the pelvis up and forward in the front and down and backward in the back. If you have sway back and weak abdominals, you should practice this exercise frequently both while lying down and while standing. Partial sit ups are done to strengthen the abdominal muscles. It is important to have strong abdominal muscles because they help increase intra-abdominal pressure while lifting. This takes some of the weight bearing and stress off the spine. Partial sit ups are done correctly with the hips and knees slightly bent. One should raise the arms, head and shoulders off the floor as shown. The position is held for five to ten seconds. One should never raise to the point that the lower back is lifted from the floor. This causes too much pressure on the disc and is unnecessary for abdominal muscles strengthening. The feet should not be stabilized; stabilizing the feet will allow the hip flexor muscles to do the work and you may be getting the opposite effect that you want with this exercise. It is important that the pelvis be tilted in order to keep the lower back flat on the floor throughout the exercise. The partial sit up should be done with a slight right and left twist to strengthen the oblique muscles of the abdomen. Strengthening exercises such as this should be started mildly and gradually increases in number as the muscles get stronger. They should be done once or twice a day. These exercises cause increased pressure on the disc and should not be done by someone with an active disc disorder. The double straight leg raise is an excellent exercise for strengthening the lower abdominals. The pelvic tilt is a necessary part of the double straight leg raise and must always be done while doing this exercise. The double straight leg raise is done correctly by first doing a pelvic tilt to press your lower back against the floor, then raise the logs a few inches and hold 5 to 10 seconds. 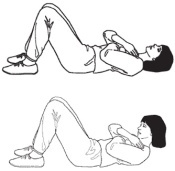 If you are unable to hold your lower back against the floor as you raise your legs, your abdominal muscles are weak and you should start this exercise with knees bent or with your feet against the wall As you become stronger, you can gradually advance toward the flat double straight leg raise or the double leg lift with the hips flexed. These are the most advanced ways to do this exercise. The quadricep muscles help extend the legs from the squat position. They are especially important if you do a lot of lifting from the squat position. To strengthen the quadricep muscles, stand with your feet together approximately 18" from the wall, lean against the wall and slide your back down the wall until your hips and knees are bent. Hold this position for fifteen to thirty seconds. If you are stronger, slide further until your hips and knees are at 90 degree angles. Also as you become stronger, the hold time can be increased. Weak back muscles and jobs that require a lot of sitting or standing in the forward bent position often contribute to a flat back posture. This exercise is sometimes referred to as the "superman." If you do a lot of sitting or forward bending and lifting, these exercises will be especially beneficial. These exercises should be started gradually and done once or twice a day. You may increase to doing 40 to 50 each. Small ankle and wrist weights can be added to make these exercises more advanced.